It’s exciting to be straightening your teeth with Invisalign aligners, the alternative to traditional wire braces. And although you change out your aligners every two weeks (or as prescribed), you still have to take care of them. 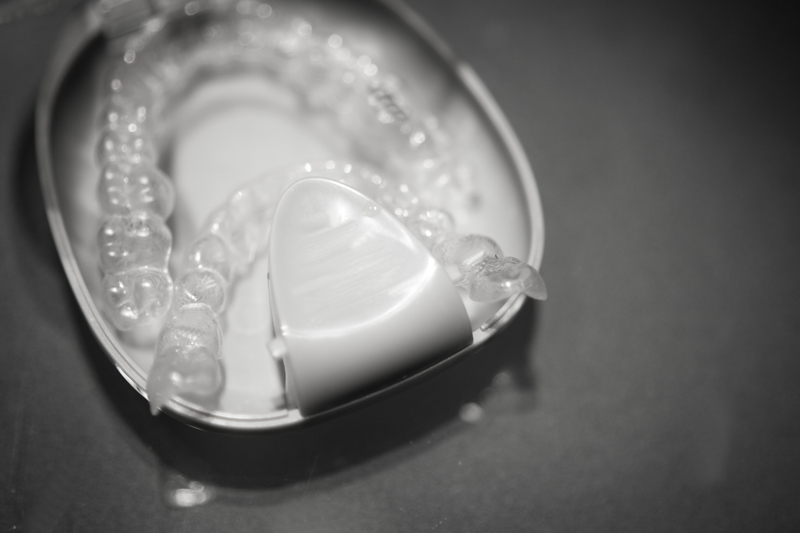 Here is a quick guide on how to clean your Invisalign aligners. Since you will be wearing your Invisalign aligners for most of the day, you generally only take them off for eating and brushing your teeth. Make it a habit at morning and night brushing times to also clean your aligners, using a clear, unscented, anti-bacterial soap. You can use a soft toothbrush, but make sure it is a different toothbrush than you use for regular brushing with your toothpaste. Rinse them thoroughly with lukewarm water. Water that is hotter may warp your aligners. When rinsing or cleaning your Invisalign aligners, do not use toothpaste. Toothpaste contains miniscule scrubbing particles that can leave scratches on your aligners, creating spaces for bacteria to harbor. Toothpaste can also cause your aligners to look cloudy, which would make them more noticeable when you are wearing them. Using scented soaps on your Invisalign aligners will leave behind a chemical-like taste that is not desirable. This bad taste is caused by dyes and fragrances that are added to scented or colored soaps. Soaps with dyes can also discolor your aligners. Every time you remove your Invisalign aligners, for eating or dental care, rinse them off in lukewarm water. This will help prevent the buildup of odor-causing bacteria. When removing your aligners for eating, always rinse and store them in your carrying case. Do not place them on the table or other surface where they can be lost or damaged. Since they are clear, it is easy to overlook them, lose them or set something down on them. If you want to deep clean your aligners you can use Invisalign cleaning crystals or fizzy denture cleaner tablets, rinsing them well before putting them back in your mouth. Do not use bleach. Bleach can break down the plastic and is harmful if put into your mouth. It will also not remove stains from your aligners. It may be tempting to be lazy and not remove your aligners when eating or drinking, but chewing can break, scratch or dent them, or create the possibility that the aligners will pick up stains or odors. Food or sugary drinks can also become trapped between the aligners and your teeth, creating a harbor for cavity-causing bacteria. Foods and beverages can also stain your aligners, causing them to become unsightly. It is okay to drink water while wearing them. We’re glad you have chosen Invisalign to give you a dazzling smile, and are glad to offer our guide to how to clean your Invisalign aligners. If you have questions about Invisalign, how to clean your aligners, or wish to explore getting an Invisalign treatment plan, please contact Advanced Family Dentistry to set an appointment. We are a family dental practice located in Reston, Virginia and serving Northern Virginia.